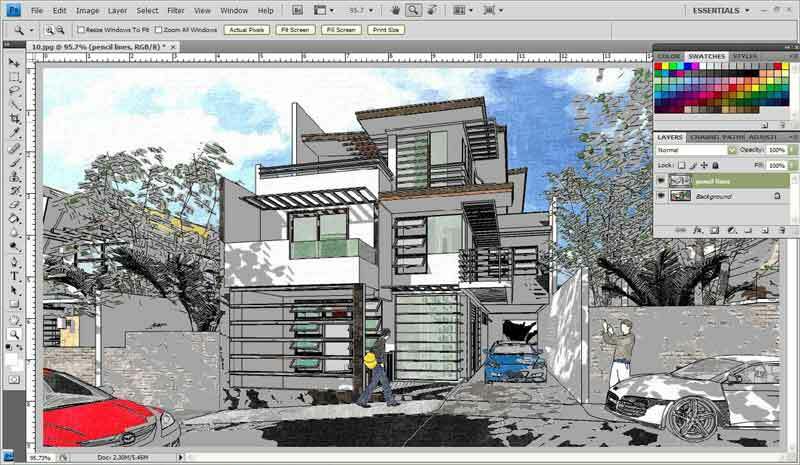 Architectural 2D to 3D visualizer and graphic artist Jonathan Ignas shows us his technique on how to create a digital watercolor using Google SketchUp, Fotosketcher and Photoshop. 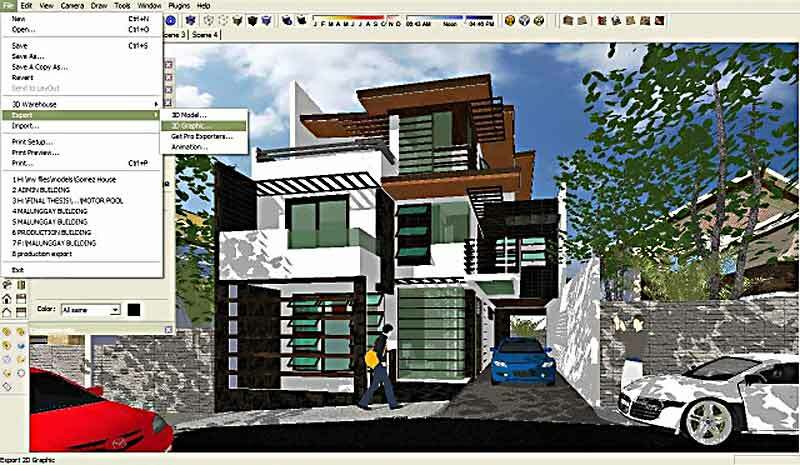 Basic skills in Google SketchUp and Photoshop are necessary to successfully complete this tutorial. 1. Let us prepare the first image. 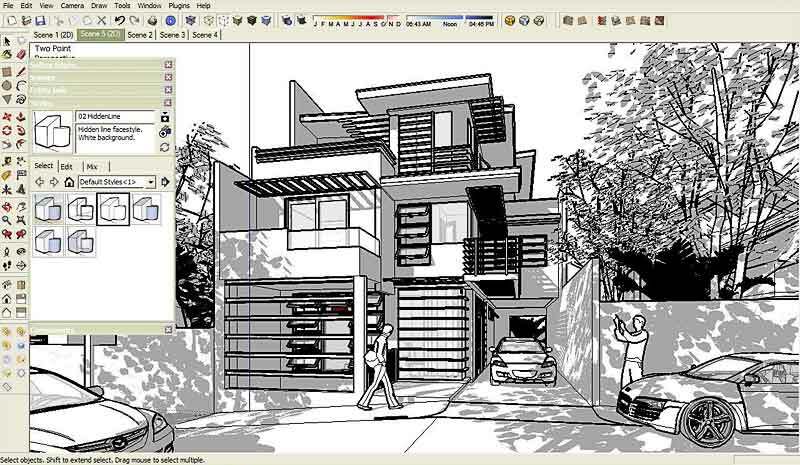 Set up your SketchUp model (Window>Styles) with the Default Style ‘Shaded with textures’ and sky enabled, with Shadows on. With your model now textured as you wish, we can move on to the next stage. 2. Go to Window>Styles and uncheck Display Edges and Profiles under the Edit tab, to turn them off. Get the view you are happy with and save a Scene under View>Animation>Add Scene, and click Create Scene. 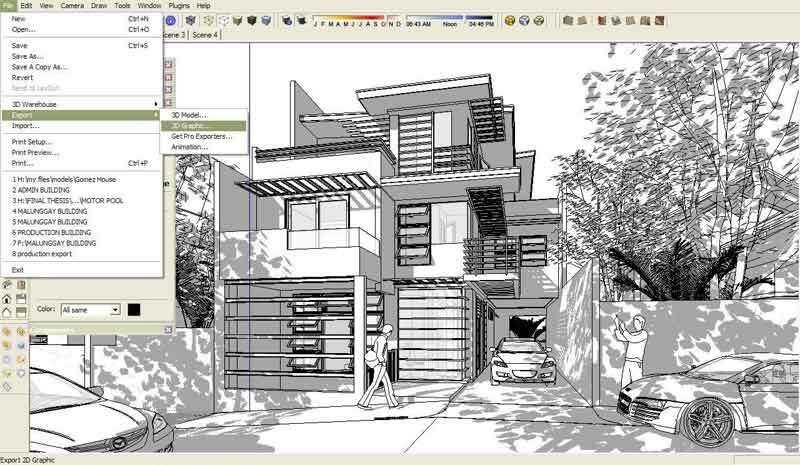 By creating this Scene you can get back to the same view and settings you created if need be. If you accidently move the model out of position, click on your saved Scene tab to return to its original position with settings. 3. Now our scene is ready to be exported. Go to File>Export>2D Graphic and save as a JPG. in your desired location. This will be the background image in Photoshop, once its put through Fotosketcher. 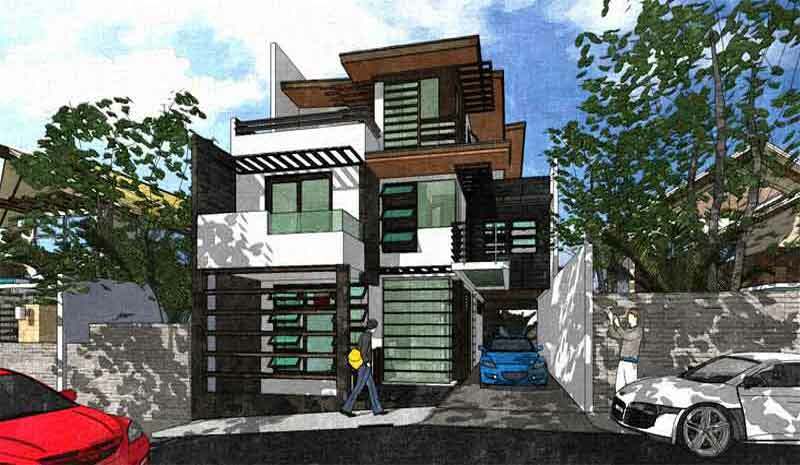 Here is the exported image from SketchUp. As you can see the image has a Background, with Texures and Shadows 0n and Edges and Profiles off, so no lines are showing in the image. Later we will open this image in Fotosketcher for the watercolor effect. 1. Without moving the model, go to the Styles tab and change the Default Style to Hidden Line face style with a white background. 2. To make your lines look thinner, uncheck Profiles and leave Display Edges checked, under the Edit tab. Save this Scene again under View>Animation>Save Scene. So now you have two scenes, with the model in identical positions, but with different settings. So again, if you were to accidently rotate or zoom in or out you can go back to its original position by clicking the Scene tab. The two views have to be identical, as they have to line up correctly when placed, one on top of the other in Photoshop. 3. This scene is ready to be exported. 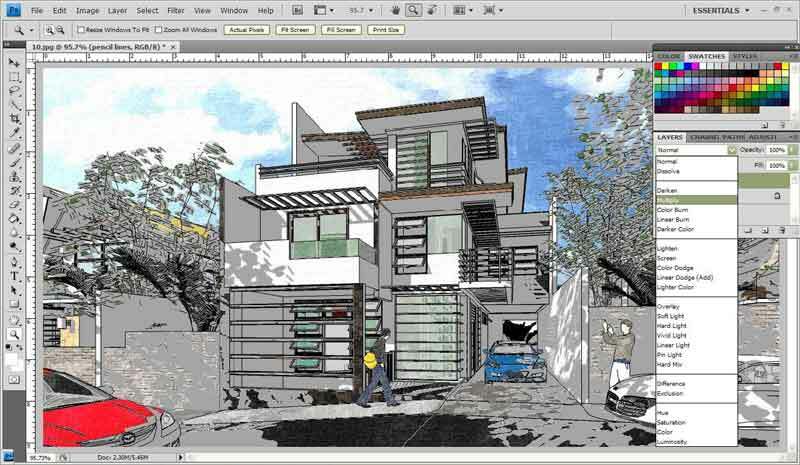 Go to File>Export>2D Graphic and save as a JPG in your desired location. You can call it ‘Pencil Lines’. 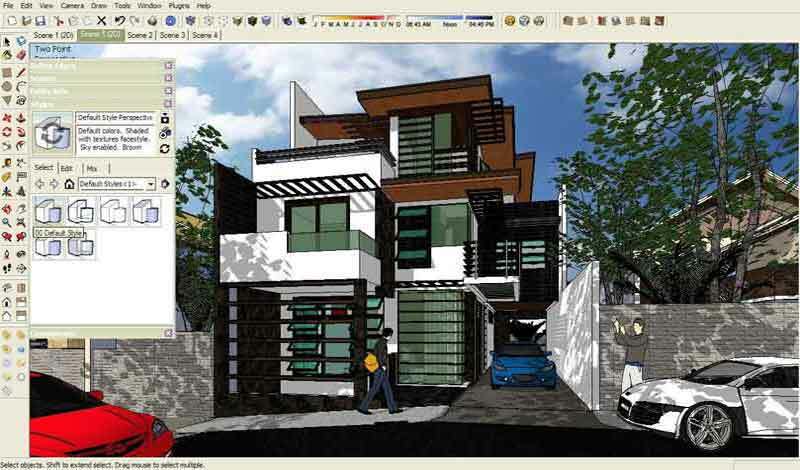 Now, we open the first colored image in Fotosketcher. 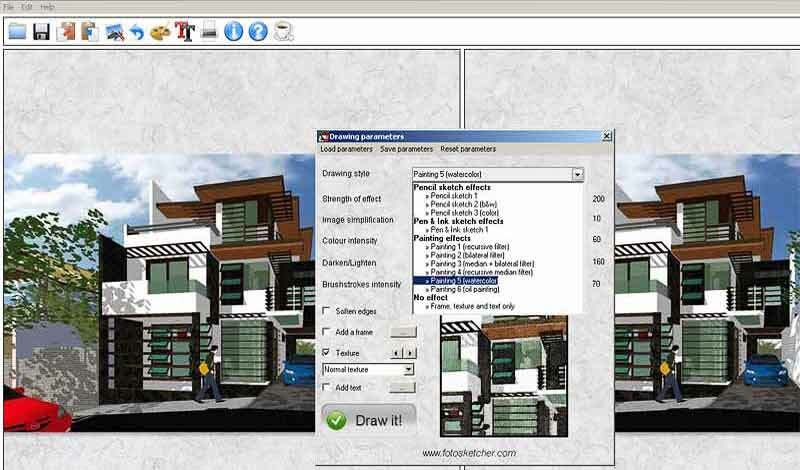 FotoSketcher is a free program which can help you convert your digital images into art, automatically. I changed the style of the image into a watercolor effect. You can be as creative as you want here! 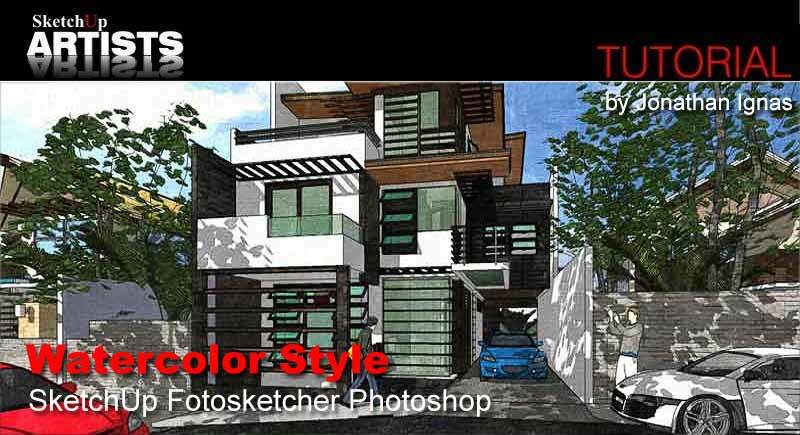 This is the result after applying the Painting 5 water color effect in Fotosketcher. Save your new image as Fotosketcher image. Now we move to Photoshop. 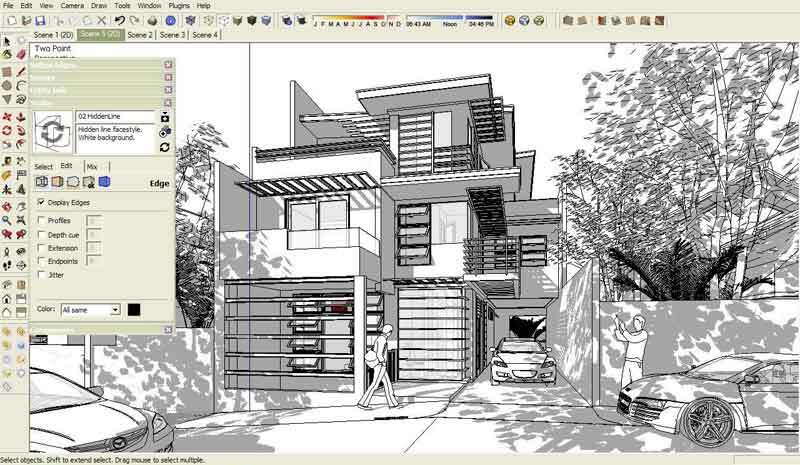 Open the second exported image (Pencil Lines), which is the Hidden Line face style, with white background. In this image I only want the lines and shadows, so we need to clear the white areas. By using Color Range (Select>Color Range), we can pick the white areas we want to delete. With the settings shown in the image below, use the Eye Dropper to pick the white area, as we only want to leave the lines and the shaded parts and press OK. Here is the result when selecting the Color Range. Now just hit Delete on your keyboard to remove the white areas. After hitting delete key, go to Select>Deselect (Ctrl+D) and deselect the color range area. As you can see, only the lines and the shaded part are left after using color range. We will place this image (Pencil Lines) on top of the Fotosketcher watercolor image in the next step. 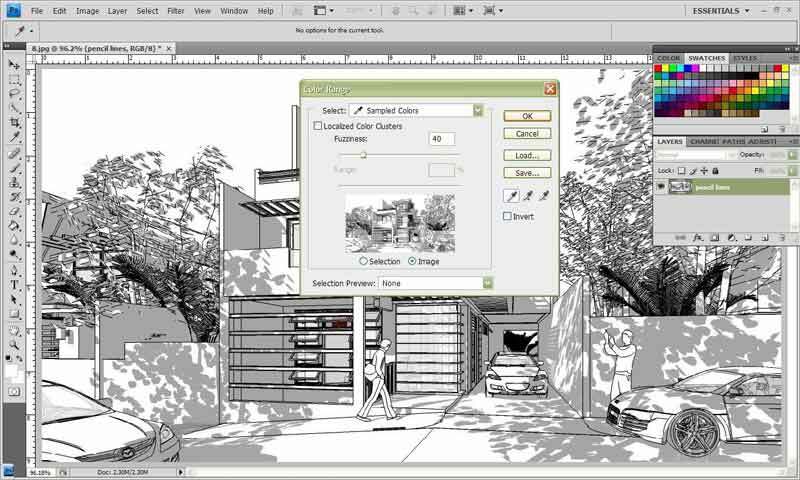 Next Open your Fotosketcher watercolor image and move the Pencil Line image on top so it lines up with the colored image below. These are the two layers combined, Pencil Line image on top of the Fotosketcher Watercolor image. 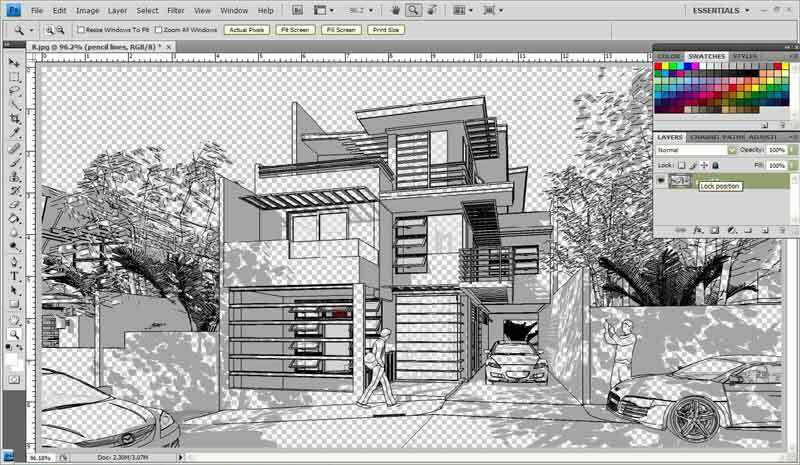 Click the top layer (Pencil Line) and change the blending mode to Multiply. We are doing this to leave only the lines on top and make the shaded areas merge into the bottom layer. You can lower the Opacity of the layer from 100% to 80%, just to make the lines more thinner and finer to achieve a nice watercolor with simple line effect. Thanks for reading and I hope it will give you a new insight into producing a nice digital watercolor effect that you can use in presenting some of your drawings. Johnathan is based in San. Vicente, Victoria, Tarlac in the Philippines. 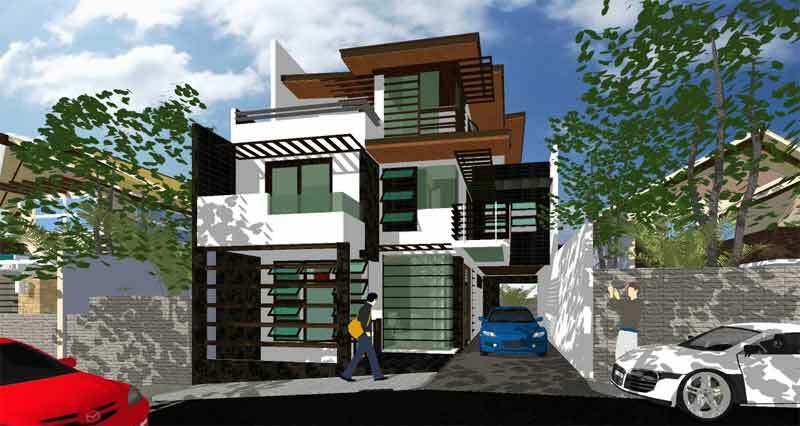 His areas of expertise include architectural planning and designing, 3D modeling and 3D visualization. 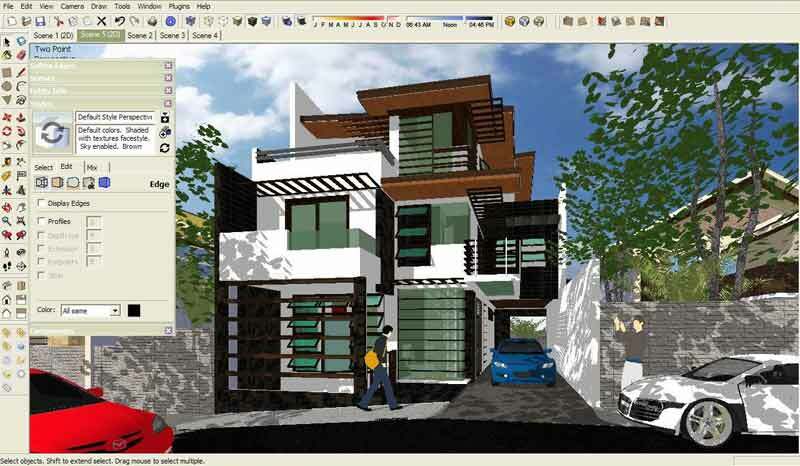 He is skilled in Photoshop, Autocad, SketchUp, V-Ray for SketchUp and Photoscape. You can see more of Jonathan’s work on his blog designanthology.